Say "wild" and "New York City," and few might fill in these blanks: a flock of feral turkeys causing a flap in a city that defines urbanity. 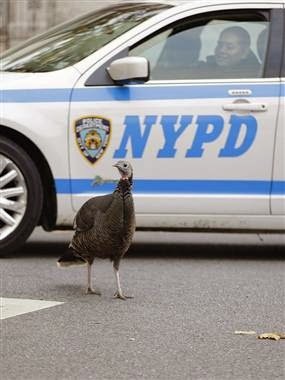 Yet a population of roving turkeys on Staten Island has become a mess-making, traffic-stopping scourge to some residents, an impromptu natural attraction to others and a fraught project for government officials. Since dozens of the turkeys were rounded up and killed this summer, the birds' future has become a topic as heated as a Thanksgiving meat thermometer. "We don't want to kill them. We just want them to leave us alone," says Barbara Laing, who watched as at least 50 turkeys converged outside her house around sundown one recent evening with a chorus of honks — their own and those of drivers futilely trying to shoo them out of traffic. Great Informative blog.. thanks for share with us. Now a days cutting the trees and deforestation is very big problem for Nature... So we need conservation services and environmental services for good environment and better future.